Looks like we’re headed for a big milestone on the Internet: 200 million registered domain names. By the end of Q1 this year there were a total of 193 million domain names when counting all top-level domains. That was two months ago. When we say all top-level domains, we mean both gTLDs and ccTLDs. gTLDs are those generic top-level domains like .com, .net and .org. 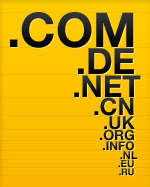 ccTLDs are country code top-level domains such as .de, .cn and .uk. We may already have passed 200 million domain names, actually. Two months ago, there were less than 117 million gTLDs. Now there are almost 121 million. That’s an increase of more than 4 million domain names, and that without including the more than 240 ccTLDs that exist out there. So, if you count all top-level domains together, 200 million either is very, very close, or a number we’ve recently passed. 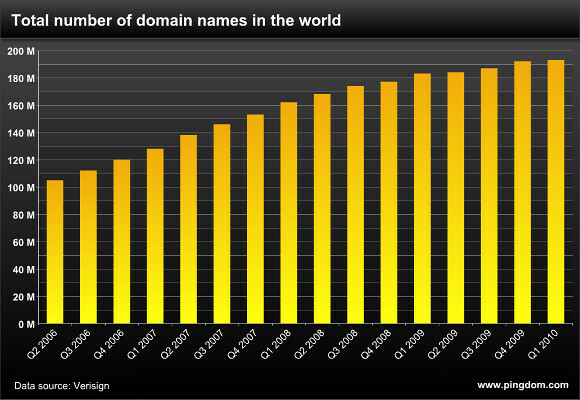 To put the 200 million number in perspective, it might be worth to point out when we passed 100 million domain names. The Internet did this back in Q2 2006, so it’s not too long ago. Above: The weak increase in Q1 2010 is mainly because China changed the rules for .cn registrations, which made millions of .cn domain names drop off. And for those of you who wonder how many of today’s domain names are .coms: There are almost 88 million .com domain names. That’s more than six times as many domain names as the second-largest, .de (Germany’s ccTLD), which has 13.7 million domain names. Com is still the undisputed king. Data sources: Verisign Domain Name Industry Brief, RegistrarStats, DENIC. Further reading: Interested in domain names? Check out the domain name infographic we recently put together. Did I misunderstand, or did you actually mean that .de is larger than .org or even .net (what about .us)? That’s very surprising to me. @Tim: No misunderstanding: .net is third, slightly below .de, yes, and .us isn’t even in the top 10 ccTLDs.